After reading about Music while Toobing, be sure to check out the latest tool for bringing music toobing, The RADIORAFT. Way back in the dark ages of 1981, when I was first introduced to toobing, going toobing was all about getting back to nature and enjoying the peace and quite of the river. The sounds of water rippling over fallen trees or stumps and the chirp of the birds and sounds of the crickets were like music to us. We would just sit back and be quite and listen as we floated down the river. If a word was spoken, it would always be in a low hushed tone so as to not startle any of the performers in the symphony of nature. It was peaceful, quite and relaxing. In those early days of my toobing career we simply carried our own toobs up the trails at Chickasaw Creek and floated back to our car. It was easy and free. We never saw another person on the water. We would see other folks swimming at sandbars but we never saw any other people either in boats, canoes, kayaks or toobs. We carried no gear with us, no coolers, no food, nothing. We would sometimes take a drink in a plastic bottle but that was the extent. On about the third trip down Chickasaw Creek, as we entered the water to begin our float, I spontaneously started singing the theme song to Gilligan’s Island. Everyone just joined in as I sang, most probably to try to drown me out but regardless, this was the first instance of actual music while toobing. From that day on, each trip to Chickasaw Creek began with the singing of the theme from Gilligan’s Island. It was a tradition that endured for many years and countless trips. As time went on, we discovered other songs that were great to perform on the river, Proud Mary (Rollin on the River) was one stand out, but by far the most appreciated tune on the river was the whistled theme to The Andy Griffith Show. With no one to hear but ourselves we were free to sing out loud and whistle to our hearts content with out worrying that someone would hear. During the Chickasaw Creek era that was the extent of music on the river. After I had to stop going to Chickasaw Creek in the early 1990’s and started toobing in more public places we let go of the tradition of singing the theme from Gilligan’s Island when we got into the water. We tried to keep the tradition for a little while but after some of the looks we got from other toobers we just let that tradition slip away. 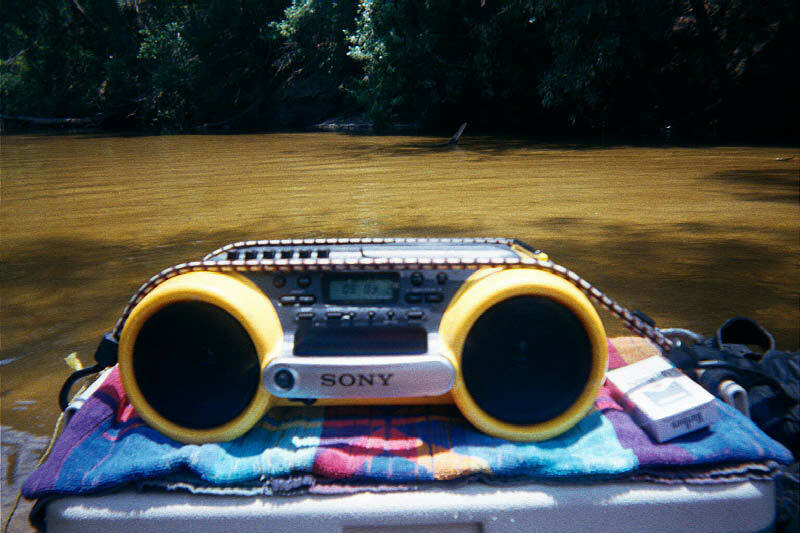 In those days, music on the river was something that we heard when we floated past big four wheel drive trucks with “big ol’ tars” that had pulled up to the rivers edge and usually it was some hair band crap from the 1980’s playing anyway. Music on the river was non-existent or non-enjoyable. Juniper Creek in North-West Florida is a very primitive river. There are no facilities on the river and there are no houses along it either. It is a beautiful creek and very much like Chickasaw Creek in Mobile County. While toobing Juniper one day, we heard some music emanating from the river behind us. The music continued and we all got quite to enjoy it. I can still remember the song, “Woodstock” by Crosby Stills Nash & Young. As we listened to the beautiful music, we all noticed that the music was getting louder. We looked around and shortly a canoe came up behind us. In the canoe was a portable radio. At that exact moment I had an epiphany. Whether for better or for worse, the river would never be quite again. Music would ring through the trees and along the waters edge wherever I went toobing. I carefully watched my ice chest for the rest of the day to see how badly it got splashed. My first thoughts were to get a “sports” radio. If you don’t know what I am talking about, a “sports” radio is one that has rubber gaskets along the seams, the speakers are waterproof and sealed, the knobs and buttons are made to be water resistant, and the radio itself is usually colored yellow. I reasoned that I could get a small “sports” radio and strap it onto the ice chest with something, If the radio did get wet and ruined, I would not be out much money. That evening a friend and I went to Service Merchandise and looked at portable radios. Service Merchandise had three different “sports” radios. The first one was just what I had envisioned. It was just an AM/FM radio, had one 4” speaker and a handle. It was low priced and sounded okay. The second “sports” radio was an actual boom-box and in addition to having an AM/FM radio it also had a cassette deck, remember this was the 1990’s and Compact Disc had not totally replaced cassette tapes at that time. The radio had two speakers and had better sound than the first one. The third “sports” radio was a monster. It had dual 5” speakers and had a CD player. At the time I was dead set against ever taking CD’s out of the house, I would not even have a CD player in my car. If I had something on CD that I wanted to listen to in the car I would just make a tape of it. I certainly was not going to carry any CD’s on the river. But when I listened to the CD boom-box it had the best sound of any of the three. It also had a steep price tag, over $200. I agonized over which one to get for about 2 minutes and then decided that I would get the one with the CD player even though I would not use the CD feature, it just had phenomenal sound for a boom-box. For $200 it should. I then had to decide how to attach the boom-box to my ice chest. A quick trip to K-mart and the problem was solved. Praise the Lord for bungee cords. The next day I had to go toobing again just to try it out. It was a hit with everyone. People followed me all day just to listen to the music and I heard “turn it up!” more than a few times that day. A new era had begun. Here is a photo of the original "toobing radio." That original boom-box lasted for 5 years before I retired it. The boom-box had been rained on, splashed and actually had a wave of water wash over it once when I took it down some rapids. The wave that washed over it was so strong that everything on the top of the ice chest got washed off except the boom-box and that was because of the bungee cords, and still the water washed the boom-box all the way to one side where it was hanging half-way off the ice chest. The point is, that boom-box took some abuse, I still have that boom-box, it is actually sitting on the floor next to my bed. It still works but after about 200+ trips down different rivers and all the sun and heat that goes with it, the speakers just did not sound as good as they originally did. In 2000 I decided it was time for a new radio, I went on a search but the options were very limited. Apparently ‘sports” boom-boxes had already seen the height of their popularity. I only found one model of “sports’ boom-box that I would even consider buying. It had AM/FM, cassette and a CD player. I decided to get it. About this time I got my first CD burner. I loved making my own CD’s to take toobing. At this time I have made 20 different toobing compilation CD’s. This particular boom-box had bigger speakers but not as much power. The unit was just not as loud as my previous boom-box, but it was about $150 cheaper than the original one also. Don’t get me wrong, the sound was great but the unit lacked the loudness that I desired. 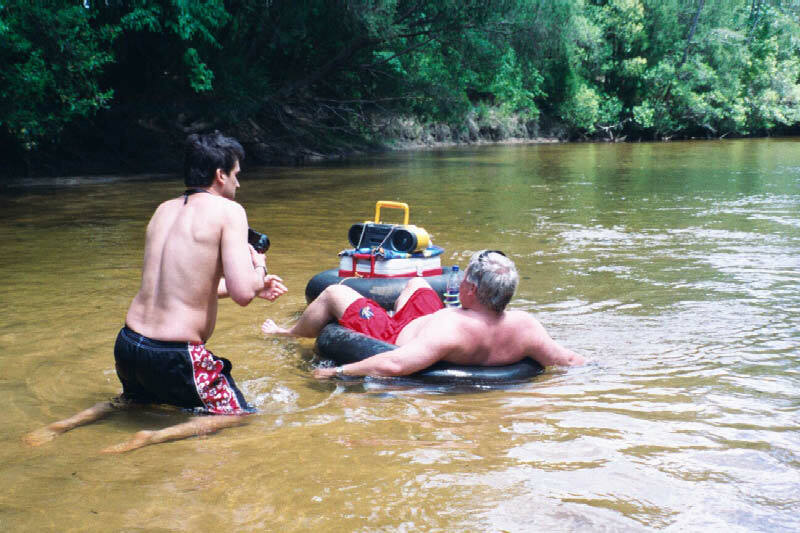 In June 2002, a leaking cooler toob caused the cooler with the radio on top to flip over in the river. That pretty much ended the life of that particular unit. When I turned the cooler back over and pulled the radio off the cooler about a gallon of river water came gushing out and the unit. Water resistant does not mean you can submerge it. The search was on for the next radio. Since we had already made plans to go toobing the next day, I had to go shopping that night for a new radio. I found one that had AM/FM and a CD player, no cassette. The one thing that I really loved was that the unit played MP3 files. That night I sat at my computer and burned a data CD with 180 songs and a play time of close to 10 hours. The next day we floated with the CD player set to shuffle. We never heard the same song twice and I never had to swap CD’s. I still have that unit (it is not even a year old as I write this) and still love it. But something happened during the winter that was destined to change everything. That winter I received an E-mail asking about an ice chest radio. I responded with my massive knowledge of such things and spoke of the inferior radio / ice chest combos you can buy and then I mentioned the current iteration of my radio and how I bungee corded it to my ice chest. The sender replied and said that he was already aware of the radio I was speaking of, he actually had one himself, and that he wanted something louder, more like a car stereo. I had my second epiphany. One thing that bugs me is that after I started taking music with me toobing, more and more folks have picked up on the idea and now just about every third group will have a radio of some type with them. A lot of the boom-boxes that I see are not “sports” models and I have seen quite a few quit working before reaching the end of the trip. But a bunch of these boom-boxes are louder than mine and it just bugs me. So I started thinking about building a car stereo into an ice chest. I looked all winter for just the right parts and how to do it. I have purchased a Sony CDX-MP40 car stereo, it puts out over 200 watts and plays MP3s, a water-proof case designed to mount the radio in a boat, and a pair of Poly-Planer MA-9060 water proof speakers designed for a boat. I am going to put the speakers and radio on top of the ice chest and I am getting a deep cycle marine battery to go inside the ice chest to power the unit. If nothing else, it will be loud. "We can rebuild it. We have the technology. We have the capability to make the world's first Bionic Boom-box Ice Chest. Reggie Smith will be that Ice Chests Owner. Better than it was before. Better . . . stronger . . . louder." Honestly, I cannot take credit for how good this project turned out. I supplied all the parts and the basic ideas but Joe Hunter and Mike Reynolds did most of the real work on putting the unit together and making it work as well as it does. Mike mounted the radio in the waterproof housing and made all the internal connections between the radio and the housing. Joe figured out how to mount the unit, speakers and antenna to the ice chest. Here is a photo of the finished unit. The speakers were designed to be mounted horizontal but there was not enough room on the lid to mount the unit and speakers if they were turned horizontal so Joe fashioned some galvanized straps to hold the speakers vertically. The antenna was purchased from AutoZone. Car antennas are designed to be mounted through sheet metal and the lid of the ice chest was to thick so Joe drilled out a part of the lid and used washers on the top and bottom to hold the antenna secure, he then filled the hole in the bottom with foam to make the mounting water tight. The radio came with a wireless remote control and I keep it in a waterproof bag and attached to the ice chest so that I can operate the unit without opening the front cover. Here is the back of the unit. most of the wires are covered with heat shrink tubing or a plastic bag to protect against moisture. This is actually the weakest part of the installation and the most vulnerable to failure but so far I have not had any problems. I plan on doing some additional work to make this part more water tight, I just have not decided how to do it yet. Here you can see how Joe reinforced the lid with plywood to give the speakers and radio unit more stability. Also notice how the wires for the antenna and power come through the lid and that the antenna hole is filled with foam and the power lead hole has silicone sealing it. Here you can see the brace Joe fashioned to keep the battery from sliding around inside the ice chest. This leaves me plenty of room to put other items in the ice chest. I use a soft ice chest to hold ice and drinks inside the ice chest thereby keeping water from being around the battery. Here is a photo of the ice chest with the battery inside. Notice all the room. Here is one with the battery and soft ice chest in the unit. All together, with nothing in the unit but the battery, everything weight about 70 pounds. Pretty heavy for an ice chest but well worth it for the fine sound it brings to the river. At this time, I have used the radio four or five times and I have had no problems with the setup. I get quite a few questions about the unit, both via E-mail and in person when I have the unit on the river. I have had nothing but positive comments from people on it and lots of complements on how good it sounds. If you see me on the river with this monstrosity, ask for a closer look.